On leaving the aircraft, follow the signs ″Baggage-Exit″ for arrivals and baggage reclaim. The meeting points are located after the baggage claim areas, on the ground floor. Use the airport monitors to see if your luggage is arriving Arrivals A1, A2 or A3. 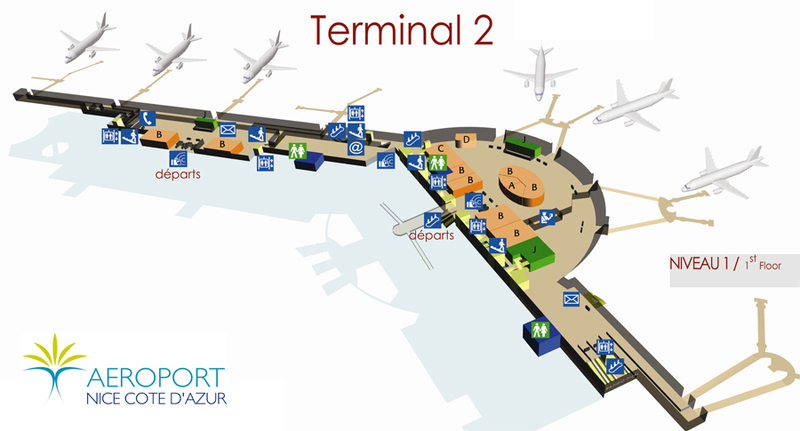 Check-in zones (A, B, C, D) are on the ground floor. Access to boarding areas & security on the ground floor, close to C-D check-in zones. Use the airport monitors for check-in and gate informations. The airport is just 6 km west of the city of Nice, reachable by the Promenade des Anglais or Motorway A8, exit 51 “Nice St-Augustin/Aéroport”. Tram & bus station are nearby Arrivals, on the ground floor, Exit A2. The ticket window is close to Exit A3, open daily 08:00-20:30 (april to october), 08:00-19:30 (november to march). The taxi stand is located on the ground floor, Exit A3. ″Nice St-Augustin″ railway station is located within a walking distance of terminal 1. ″Nice-Ville″, linked to the airport via Bus 99 Express, is Nice’ central train station with regional, national & international services. 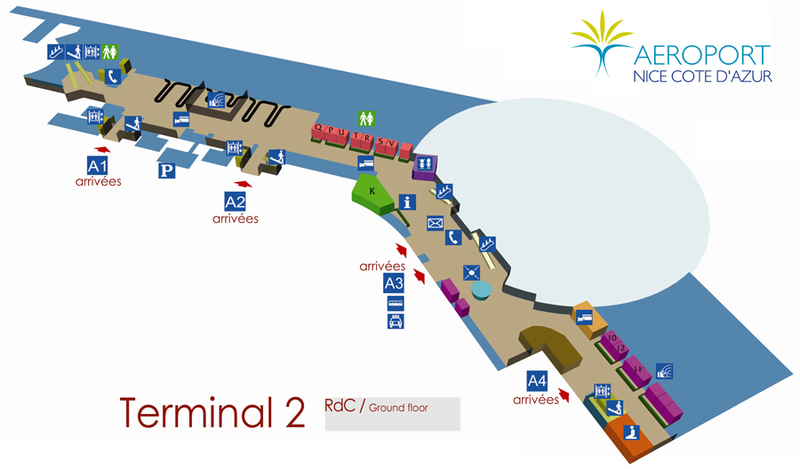 Terminal 2 and remote car parks are linked by a free shuttle bus service. 06:00-20:00 (samedi 19:00, vendredi et dimanche 20:30). Ouvert du premier au dernier vol.